New scholarship and research will be presented in three panels, examining the Korean War from a transnational perspective, attentive to ideas and cultural forms that emerged and circulated across the Pacific, and across national boundaries in East Asia. While the papers will focus on the Korean War and its impact on the cultures of China, Japan, Korea, and the United States, the larger aim is to articulate innovative ways to analyze and narrate certain configurations that traverse not just national boundaries, but also intellectual boundaries that separate American Studies, Asian American Studies, Cold War Studies, East Asian Studies, and Korean Studies. 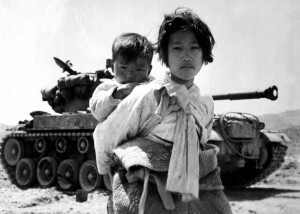 Through this transnational focus on the Korean War, presenters and discussants will examine the ways in which the Korean War constituted a historical conjuncture for China, Japan, Korea, and the United States, giving rise to dramatic shifts in popular culture and the emergence of the national security state in a decolonizing world. Academic conference will be followed immediately by Film screenings and reception at 19 University Place.